The numbers in the table do not add up as you might expect. This is because they include points for wins against MyGoFriend, and for byes while it was included in the tournament. Also, I have changed the result for the round 3 game between Zen19S and pachi2 from what is shown on the KGS results page, and scored it as a jigo. Changing the "Wins" column was easy, but the "SOS" and "SoDOS" columns were difficult and may contain errors. Before the tournament started, there were nine registered players. Adding another player would therefore avoid byes. I therefore registered MyGoFriend, which was present on KGS but had done nothing for several days. Its operators, Frank Karger 'GoCoder' and Michael Babar 'Gocrack' had last been on KGS on May 27th. MyGoFriend is particularly good at 9×9 Go, and was "Computer Go 9x9 World Champion 2010", so it would be good to have it competing. However, in case it refused to play, I also registered and ran a build of GNU Go, using my account 'gnugo3pt8'. My intention was to remove gnugo3pt8 if MyGoFriend was able to play, otherwise to remove MyGoFriend, and to leave the numbers even. In round 1 there were eleven players, as described above. ManyFaces2 had a bye. AyaMC played against MyGoFriend. As soon as their game started, MyGoFriend disconnected from the server, so AyaMC received a win on time. I removed MyGoFriend from the tournament. In round 2 gomorra16 and gnugo3pt8 failed to clean up their game correctly, both leaving on the board stones which they could have captured. But the result, a win for gomorra16, was the same as if it had been cleaned up correctly. Also in round 2 pachi2 played Zen19S. The result was jigo. After both players passed in turn. jlg: kgs had a bug in the past in cleanup mode, but this it did not happen here. gghideki: Pachi didn't agree the dead-stone-list? jlg: gghideki, Zen had the opportunity to capture C2. It lost this opportunity by passing. jlg: yes but the rules are not dead-stone-list. The rules are "all stones are alive after pass"
to resolve the dispute by marking dead stones, but Zen passed. jlg: See rules in kgsGtp.xhmtl: "... they should not pass until all dead stones are removed from the board"
jlg: in description of kgs-genmove_cleanup command. gghideki: That's sure, Noo cleanup mode in bots tournaments? gghideki: Making things clean, after undo, players have to capture all dead stones, right? gghideki: I only see just a "Warning engine still claiming C2 is dead"
gghideki: My kgs-client is 3.5.8, is this correct version? testNomi: can it be a problem with the client version ? gghideki: The KGS's bug was fixed on version 3.5.8, right? quicksand: can you manually override the result to jigo? jlg: gghideki, did zen receive the undo command? gghideki: yes, I see undo(s) on my log-file. This discussion ended with the consensus that Zen19S had acted correctly, and that because of a bug in KGS's clean-up procedure it had never been sent a kgs-genmove_cleanup command to Zen19S. I therefore stated that I would count this game as a jigo. As an admin, I have the power to override the server and assign a result to a tournament game. But I can only do this before the start of the next round, and the consensus was only reached after lengthy discussion which continued into the next round. Moreover I can only assign wins and losses, not jigo. Therefore the KGS software continued to believe that pachi2 had won this game. Its own results table shows it as a win for pachi, and I have modified it by hand to produce the cross-table above. KGS made its pairings for subsequent rounds according to this belief. I will write to KGS programmer 'wms' with a description of this incident, and hope to persuade him to fix the bug. In round 6 stv played pachi2. 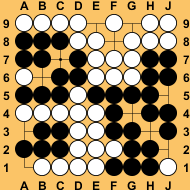 The game ended in the position shown to the right. It is a jigo, with seki in the lower left. It was handled correctly. In round 7 stv and gnugo3pt8 failed to clean up properly at the end of their game. This did not affect the result, stv won anyway. The position in which pachi2 resigned. Also in round 7, pachi2 resigned to nomiBot in the position shown to the left. 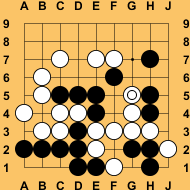 It was not obvious to me, and some other observers, that Black's position is hopeless here. But now that I have studied it, I accept that pachi2 was right to resign. After round 9, I realised that gnugo8pt3, which I was operating, was playing too fast. I started to increase its strength setting after each round, until it was at 18, which caused it to play better while still well within the time limits. Before round 15, a user told me how I could set it to use Monte-Carlo, by adding "--monte-carlo" to its configuration file. This made it play significantly better, and it beat Orego12. But pasky pointed out that I should not be making such drastic changes to it during the course of a tournament, so after this I removed the Monte-Carlo setting, and left it at its "level 18" for the rest of the tournament. Zen19S 8½, stv 8, AyaMC 7½, pachi2 6½, nomiBot 6, Fuego 5, gomorra16 3½, ManyFaces2 3, Orego12 2½, gnugo3pt8 ½.
stv 11, Zen19S 11, AyaMC 9½, Fuego 8½, pachi2 8, nomiBot 7½, ManyFaces2 6, gomorra16 5½,Orego12 3½, gnugo3pt8 ½. In round 18, gomorra16 fell asleep during its game with gnugo3pt8, and lost on time. stv 13½, Zen19S 13, pachi2 12, AyaMC 11½, Fuego 11, nomiBot 8½, ManyFaces2 7, gomorra16 6½, Orego12 5, gnugo3pt8 3. Zen19S 17, stv 15, AyaMC 14½, pachi2 14, Fuego 14, nomiBot 11½, gomorra16 8½, ManyFaces2 7, Orego12 5, gnugo3pt8 3. 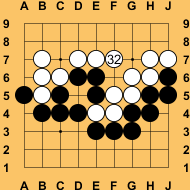 In round 23, Orego12 played move 32 as shown to the right. If it had played it at f6 instead (as any human 20-kyu or stronger would have done), it would have won the game by one point. But after this move, Black had sente and used it to play at a6. It became jigo. Orego12 had thought that it would win anyway, as it believed the komi was 7½ instead of 7. 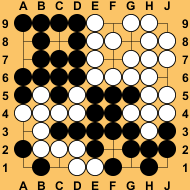 Also in round 23, gomorra16 and ManyFaces2 both passed, correctly, in the position shown to the left. Black should then have won, as it can kill the lower left white group. 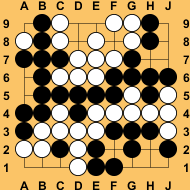 However, the players disputed the status of the group, and when play resumed Black did not attempt to kill it, so the group was treated as alive in seki with a point belonging to Black at a1, and the game was scored as a win to White by 4 points. Fuego, running on two Intel Xeon X5670, 24 cores at 2.93GHz. Gomorra, running on an Infiniband cluster using 16x12cores. Cores are running at 2.67 Ghz. Many Faces of Go, running an Amazon EC2 Cluster Compute Eight Extra Large server. Dual CPU Intel E5-2670 2.6 GHz. 16 cores, 32 threads, 60 GB shared memory.